Last Wednesday was my Mom's 60th Birthday and I wanted to do something to surprise her to celebrate, so I booked a quick little getaway to Princeton, NJ for Wednesday and Thursday. My Mom and I are both big fans of Princeton and had done a girls weekend there a few years ago that was so much fun I wanted to recreate it for her birthday. I was able to really surprise my Mom and we had such a good trip! 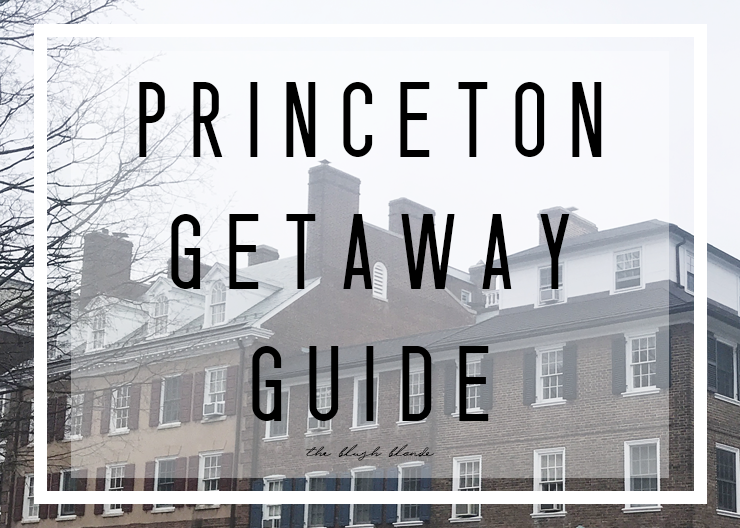 Below I am talking all about what we did and breaking down my guide to a Princeton Getaway. Airbnb - Princeton Lavender Farm || This is where we stayed during our recent visit and it was perfection. It's a brand new loft on a gorgeous lavender farm just outside of downtown Princeton. Every part of the loft has been renovated and put together to ensure the utmost comfort for the guest. Everything from the comfortable bed to the views are wonderful. It's a clean, cozy, and quiet oasis with friendly and personable owners. I really loved how you're so close to downtown Princeton and the University, but you're out on this expansive farm, which is such a different setting. I would highly recommend staying here if you're going to be in or around Princeton! I'm already trying to make plans to stay here again when the lavender will be in bloom! Princeton Marriott at Forrestal || I stayed here during that weekend trip I took with my Mom to Princeton in 2014 and you can checkout more about that stay here. It has standard Marriott hotel rooms, but I always love staying with them. The setting is also really unique and almost park like which is cool! Jammin' Crêpes || We went here for brunch on Thursday morning and oh my gosh it's SO good! They have gluten free crêpes, which I was shocked to find, and they are absolutely delicious. My Mom got a savory crêpe, which was huge and I got a gluten free "Classic Toasty Cinnamon" with whipped cream, which I cannot wait to eat again. They have a pretty extensive menu for a crêpery and also make their own microbatch jams that you can purchase. It's in the heart of Princeton and right across from the University; we went on a weekday morning and it was packed, but we were able to get a seat relatively quickly. When you go just know that it's probably going to be busy if you're there at a peak time, but it's well worth waiting for. Teresa Caffe || This is our go to spot in Princeton. I love Italian food and they have gluten free pasta so it's always a win for me. They're also really accommodating to food allergies/menu changes, which is super important when you have food allergies like I do. My Mom tries something different every time we go, she got a salad that was a special that day and she's still raving about it! It's almost always busy here and "must eat" in my opinion. Jules Thin Crust || This is a local chain that actually started in Pennsylvania where I went to school. Their pizza is always so good and they have a wide variety of options from the basics to really gourmet pies, there's really something for everyone. Their gluten free crust is also amazing and doesn't taste different from non gluten free pizza. We wanted a quick lunch before we headed home on Thursday and this was the perfect place to grab something we knew would be good! Witherspoon Grill || It was our first time here, but we heard so many good things about it that we chose this for my Mom's big birthday dinner. It's technically a steakhouse, but they're menu is pretty diverse and has a lot of options. We actually both ended up getting fish (crab cakes for me and cod for my Mom) and were very happy with our choices - we are still talking about how good the meal was! Our server and the hostess were also both incredibly nice and helpful, which was the best way to punctuate the experience! Ruth's Chris || We went here on our trip a few years ago because we are big fans of Ruth's Chris. While everything was good, I have to say that I've been to one of their Baltimore restaurants several times and I definitely prefer that location to this one. When we ate there there were some minor issues, like with how the steak was cooked: we ordered it medium, and it came out way overcooked, then we mentioned it to the waitress and the new steak they brought out was practically raw, which was disappointing especially since they're known for their steaks. While I love Ruth's Chris there are so many other restaurants and options in Princeton that I would recommend trying one of those over going here. Halo Pub || Despite its name this is not a traditional pub, but actually a coffee and ice cream shop! It's such a cute little spot and their gourmet ice cream is locally made at Halo Farm in Lawrence, New Jersey. We grabbed some ice cream after dinner from their very large selection and it was delicious! Thomas Sweet Chocolate || This is a traditional chocolate shop in Palmer Square. I always love to stop here to pick up some chocolate before I go home. If you're looking for a little something sweet this is definitely the place to go! Shopping || Princeton has a great mix of nice chain stores (J.Crew, Urban Outfitters, Ann Taylor, Lululemon, etc.) and boutiques. Everytime we go into town we love to walk around and shop because there are so many different places to see! There's also an amazing knitting and needlepoint shop in town, Pins and Needles, that has a great selection so we always land up going in there! Princeton University || I really enjoy walking around the campus to see the architecture and layout. It's especially beautiful in the fall and spring! There's also many different activities that go on on campus that are open to the public and an art museum I'm dying to check out. There's so much beauty and history here that you really can't not visit the campus when you're so close. As always I had an amazing time in Princeton and cannot wait to visit again! Have you ever been before? Ooh the eateries sound yummy! I took a look at the B&B you stayed in; it's so pretty! Waking up to that lavender field must've been a dream. That AirBnb sounds magical! I would love to checkout this area one day! I'm hungry just reading about the food!! I want to visit! I've never been to NJ. Sounds nice With great food!